For true self-sufficiency, why not grow your own bridal bouquet (this exquisite bouquet was crafted by Denise Fasanello floral design)? A number of flowers are easy to grow and make the most beautiful and long-lasting arrangements. If you’ve got a big event coming up, a little planning now will ensure loads of blooms for the big day. Keep it simple. Grow only two or three different varieties and choose flowers that are a sure bet. Annuals such as sunflowers, zinnias, snapdragons, cosmos, sweet peas and calendulas are a breeze to grow. Dahlias, ranunculus and anemones are dead-easy too. Lisianthus, on the other hand, are not. Grow varieties that are specifically bred for their long stems – dwarf cultivars may look cute but their short stems won’t give you much to grip. Select plants that are labelled as ‘tall’ not ‘bedding’. Select flowers that bloom as close to your wedding date as possible. Ranunculus and anemones are perfect for August or September weddings; sweet peas and poppies flower in October and November; sunflowers, dahlias and cosmos are ideal for summer and autumn weddings; zinnias and asters are perfect for autumn celebrations. Plant ‘fillers’ too. Scented geranium leaves, honeywort (Cerinthe major), lady’s mantle (Alchemilla mollis) lamb’s ear (Stachys byzantina), even the leaves of sweet peas, are great for bulking out bouquets if necessary. Some seed packets and catalogues state the time it takes from sowing to flowering. Each plant is different, so pay attention to these figures. Cosmos takes around 12 weeks from sowing to flowering, whereas snapdragons take around 16 weeks. However, that 12 or 16 weeks assumes perfect growing conditions – late frosts or cold weather will set back flowering. Devise a realistic schedule, adding on a few weeks to allow for all eventualities. Then plant in succession. Sow the same flower every two weeks for a couple of months to ensure something’s in bloom at the time you want. Bulbs are tricky to get right. To make spring-flowering bulbs flower later, you can’t just plant them later. They must have winter chilling and they have to be planted in autumn. Planting them in March or in May, says Paul Hoek of nzbulbs.co.nz, makes little difference to the final flowering time as it is more dependent on how cold the winter is, how much rain there is and how early or late spring comes. “The only way you can make them later then normal is to plant them in pots and then hold them in a chiller, progressively lowering the temperature from 9deg to zero deg over a period of 10 weeks. Then hold them at zero and take them from the chiller 2-3 weeks before you want them in full flower. “To make spring flowering bulbs flower earlier, you can use the chilling method above, and simply take them out early rather than late. But a minimum of 12 weeks total chilling is needed, so you can’t have them flowering in May. Annuals grow quickly and flower generously but they need all the help they can get. Feed and deadhead regularly. Use a balanced fertiliser initially, then, in the last month, switch to one that’s specifically for flowers, like Thrive Soluble Flower & Fruit Plant Food. If your plants start flowering before the wedding, deadhead the blooms once they’ve faded. If you don’t, your plants will put all their energy into producing seeds at the expense of flowers. Pay attention to watering too. A dry spell can stress plants and set blooming back a few weeks. And if the weather is unseasonably cold, erect a makeshift greenhouse using plastic sheets. Look around and see what can be used from your existing garden if your original plan fails. Ask friends and family to grow back-up flowers for the day. Have a couple of fake flowers on standby. Most people can’t tell the difference between a fake and a real flower unless they touch them. Use succulents. They’re dead-easy to grow and look spectacular in bouquets. Use flax or astelia leaves for interest. Bend leaves over to form loops that can be tucked into your bouquet. 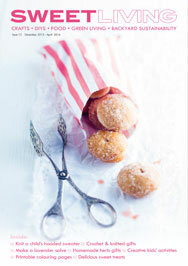 Check out my new online magazine, Sweet Living Weddings. 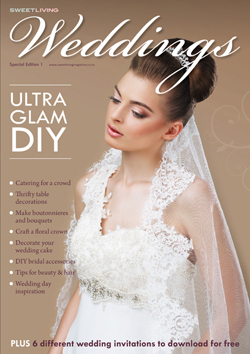 It’s massive – 180 pages worth of crafts, DIYs and tutorials for a glamorous handmade wedding. 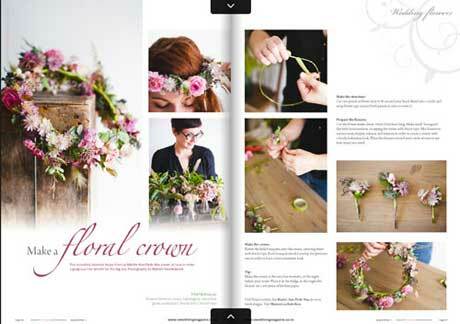 It features lots of beautiful flowers, with instructions on how to make your own floral head wreath, boutonnieres and bouquets. Plus there are cake decorating tutorials, reception styling tips, jewellery and accessory DIY projects, hair and beauty tips, and lots of real weddings inspiration. I can’t believe I have found everything I’ve been looking for on your web site, I’m very excited. How to get my garden to flower on que for my daughters wedding in Nov 2011, having a trial run this year, too growing the right flowers for a bouque. Just love it. My friend is getting married at her home garden in Timaru in early Arpil 2011. Can you give us some ideas of what we should be looking to use for colour in the garden and flowers to use for arrangements. I have a glasshouse so can use that if required. Around that time you’d be looking at the late summer/autumn plants such as zinnias, cosmos, cleome, Japanese anemones, dahlias, asters, rudbeckias, scabiosas and salvias. What you grow will be dependent on what look you’re after and what colours. If you want white flowers, white cosmos are great. As are white dahlias, white cleome, verbena, phlox and shasta daisies. If you want to go for bold colours, then the ‘Bright Eyes’ cosmos would do the trick, with yellow and orange blooms. Then you have the pale pink and bright pink cosmos. Most plants have varying colours, so if you like the look of one plant you can choose the colours to suit. Zinnias and asters, for example, come in a rainbow of colours. Don’t forget your fillers either, like foliage (Dusty Miller senecio has gorgeous silver foliage) and even the rosette-shaped succulents. If you’re wanting a formal look in the garden, standard plants in containers, such as roses and hibiscus. Brilliant! Just what I needed. The wedding is in March. Now’s the time to get cracking. You’ll want to sow either fast-growing annuals or plant seedlings or small plants to ensure you have something in bloom at the time. Cosmos, cleome and zinnias are prolific bloomers and fast-growing and they’re very easy to grow from seed. There are both white and pink varieties, in vivid pink or pale pink. You can plant dahlias tubers too, which come in many, many colours. Choose a number of different dahlia forms – pompom, waterlily, cactus, etc. Other plants to grow (not from seed) include hydrangeas, alstroemerias and pelargoniums. Pelargonium leaves make a great filler too. Another option is to grow white pansies for your table decorations and pot them up in pretty containers or vintage teacups. Just wondering if you knew of anywhere that i can buy fresh flowers to make all my own flower arrangments etc for my wedding? I love the idea of growing my own but i live in the Waikato and am getting married in Tutukaka, meaning i would have to take the flowers up a week before!!! I see my self picking and choosing what flowers i want the day before the wedding in a huge flower market…am i dreaming??!! Do you know of anywhere in Northland/Auckland that i could do this? The flower markets that I know of are flower auctions in Auckland but that might not be suitable for you. They only run them on specific days and they’re very early in the morning. Plus you may have to be an account holder to do business there. Your best bet might be to suss out a local market/farmer’s market. In Auckland there are several. For example, on the North Shore the Takapuna Market, which runs every Sunday, has a few flower stalls, and I’m sure that would be the same for other markets. Here’s a link to markets in Auckland North – http://www.eventfinder.co.nz/markets-fairs/events/auckland. You could also google farmer’s markets. Most have email addresses, so you could email in advance to check that they do have flower stalls. OK so my idea of buying flowers from flowers markets are a no no!! All the markets seem to be on a weekend and I’m getting married on a Friday. But i have emailed a few florists to see if they would get the flowers in and then i could buy them then do fancy things with them myself! – I’m not sure how keen they are going to be on this as they will be losing out on money! I know i could grow my own – but I’m so terrified that they will all die, or just not grow!! All the flower arrangements I’m looking at are very simple and kind of thrown together (but still look lovely) kind of way and I’m finding it hard to spend lots of money for someone to do what myself and a few friends could do ourselves!! I reckon a florist would order the flowers in for you if you ask her/him. They’ll still be making a buck themselves by selling it to you for a retail price (they’re getting them wholesale). Of course, the harder the flowers are to come by at the time, the more expensive they become. What flowers were you thinking of? Roses and cala lillys in hot pinks and rust colours. So maybe there are other stand out flowers in those colours that would be cheaper? I thought i might pop into a local florist and see if i could find some flowers and see what goes good together to give myself more of an idea! I think it would be a good idea to pop along to a local florist and see what’s there. Ask the florist for her ideas on what flowers are available at that time in those colours. They will definitely have calla lilies (you’d have to check on the rust colour though) and, of course, roses. But they will also have many other flowers in hot pinks (gerberas, Oriental lilies, even hydrangeas). Do any of your friends or your friends mothers/fathers have roses growing in their backyard? Could there be potential for raiding a friend’s or family member’s garden near the time? Or get them to bring them up for you? Thankyou so much for all of your help – I’m sure I will be asking more questions soon! I was excited to come across this website today as I hope to grow my own flowers for my November 4th wedding this year; I want to make my bouquet, the button holes and also corsages for my bridesmaids. Could you give me some ideas of flowers that will be easy for me to grow and suitable? I think colour wise I would like a mixture but leaning towards purples and pinks to go with what the wedding party will be dressed in (bridesmaids will likely be in pinks and groom in navy with some purple/pink in his tie). I am thinking I’ll include some flax and rosemary that are already growing in our garden for the greenery and scent…any advice is very welcome! At that time roses will be in full bloom, so I’d be inclined to go with these. Though you’d really want an existing bush to ensure plenty of blooms. Ask friends and family what roses they have growing and maybe you can use these. I’d plant cosmos too – there are pink or white varieties, as well as bicoloured pink and white. Sow them in trays mid to late August, placing them in a warm spot to germinate. Plant them out (you can plant them in containers if you like to keep a good control on them) when the weather has warmed up. And there’s sweet peas. They’re beautiful in bouquets and they have the most exquisite scent of course. You can sow those now. Sow them in succession, every two weeks, to ensure you get plenty of blooms on cue. Plant anemone bulbs now and they should still be flowering by November. Don’t forget backup plants like succulents and air plants. For me, they can truly look divine. Click here to check out these bouquets with succulents and airplants. Thanks so much for the suggestions, I’m not a big fan of roses so am trying to avoid those but we have planted some anemone bulbs and are keen on the sweet pea idea too if we can find something for them to grow up. Will anemones or cosmos float happily on a bowl of water for table decorations? I’m not sure that cosmos would float very well in a bowl of water. The petals may be too delicate and become waterlogged. A tougher flowerhead, such as gerbera or some other daisy, would be better for floating. Possibly clematis flowers would work too. Anemones should be fine. Hi awesome website..im just wondering do you know any flower grower/supplier who can supplier ranunculus for a late dec wedding? Im looking for orange flowers but my florist keeps asking me to use mokara orchids..
i cant think of a bouquet that will look nice with mokara? Unfortunately ranunculus are cool-season flowers and will stop flowering late spring/early summer. Have you considered orange calla lilies or orange roses? There are also Asiatic and Oriental lilies that bloom around that time. Asiatics bloom around November/December, and Orientals, which are scented, bloom from December to March. Fantastic site! I have just read your correspondence with Emma as I am having a November wedding also on the 12th. Ive taken those suggestions on board, but am also wondering as i love peonies, how easy are they to grow and would they be flowering at that time? Also we are having a vintage inspired wedding are there any old fashioned type flowers you think would be suitable? First of all, if you don’t mind me asking, where do you live? Peonies like cool weather so growing them will depend on where you live. You also may not get flowers the first season either, so is your wedding this year or next year? As for vintage flowers, have you thought about hydrangeas? They will only just be in bloom at that time, but I always think of these as old-fashioned – albeit very fashionable at the moment. Gladiolus is another old-fashioned plant making a comeback. And daisy-like plants too, like these ones here. Have a read of this answer here too, in the comments section, also regarding a wedding in November. It seems you’re an expert on flowers. A very nice color combination on that and very good design. I too were a fan of floral design currently oredring on Flowers on Cashmere in NZ. I am getting married in January 2012 & would love to do my own flowers/floral arrangements.You site is amazing!I am having a vintage + rustic themed wedding & am currently growing my own Hydrangeas, Succulents etc.I had my heart set on Peonies as the main flower in my bouquet but have found out they will not be in season, this is when I found your link about Cabbage Roses!(AMAZING! )I was wondering if you know anyone who sells them pre-cut or any David Austin Roses?I have found a lot of places that sell them as a whole plant but can’t seem to get my hands on a wholesaler etc.We live in the Auckland area. i love the bouquet by Denise Fasanello at the top of the page. could you tell me which flowers are present? I am getting married June 2nd in Nashville and I’d love to grow my own flowers. I have two young peony plants that i’m not sure will bloom in time. are there some annuals that have the similar wild, delicate look that peonies present? also I just came across a beautiful poem by Mary Oliver called “Peonies” that I think you would love. The flowers in this bouquet include roses (pink and white), white nigella (love-in-a-mist), white tulips and white spiky veronica.The green foliage looks to geranium leaf. Peonies don’t usually flower until they’re around three years old so it will depend on how old your plants are and whether they’ll produce enough flowers. There is not really an annual substitute for peonies that has that full petalled look. Roses are your best bet. You may have already seen this story, Substitute for Peonies. Otherwise you could try cosmos (they are not full petalled though) or double tulips. I’m unfamiliar with the seasons in the States, sorry, but here, spring bulbs need to be planted in autumn. Hope this helps. Jane. I love this so much great Information ! I have a rather good sized garden in Mount Albert with great soil , Im looking to grow as many flowers for my special day on the 10th Of October 2012 , Im finding it hard to find the right types to grow to be ready to use around this time , and ideas would be great to set me in the right direction ,I want to get started now so it will not on the list of things to worry about later and being in my garden really brings me alot of joy ! You could go for bulbs such as anemones, ranunculi (these can both be planted from now until May – I’d plant them in succession so you have a greater chance of getting some flowers on the day), daffodils (plant March), and tulips (plant April/May). As you live in Auckland, you will need to pop your tulip and daffodil bulbs in a paper bag in the fridge for 6-8 weeks before planting to ensure flowering. Flowering time is often dependent on weather (can be delayed or brought forward depending on warm or cold weather), so I wouldn’t rely entirely on bulbs. Do you like succulents? Get some of those and plant them now. You could sow poppy seeds now too, as well as campanula and delphiniums. I am unsure as to what flowers are in bloom in summer around January and which ones are easiest to grow yet still look great. I like the look of many different flowers including calla lilies, roses, oriental lilies, gerberas, carnations, iris (blue). I am looking at having blue as a colour theme, and I am not sure what blue flowers are out there (for possible bridesmaids flowers), or if I am best to go with something else or more easily accessible. Any advise you could give me would be greatly appreciated. Hi Michelle. Would you be able to let me know what area you live in? I had another thought of what I should have asked you, what kind of flowers are good to grow for ‘fillers’ in the bouquet? I’d say the pros of growing your own blooms is the absolute pride and delight of picking your own bouquet on the day. The con? You need to be organised, as well as have a backup plan. Think carefully about whether it’s something you want to do. You may be so busy on the day getting ready, or getting other things organised, that you don’t have time on the day to actually fashion a bouquet for yourself and your bridesmaids. But it can be fun. I’d advise to keep it simple. Grow a plant that’s prolific. Cosmos certainly are, as are dahlias. Both can be planted in spring. There are blue hydrangeas, of course, of you want a blue bouquet. Buy those as soon as you seen them in garden centres in spring and get them planted quickly to give you reasonably blooms for January. I would plant several hydrangea plants if you were going down that track. The bulbs of calla lilies can be planted in spring, as soon as you see them in the shops, which is usually around September. Again, plant quite a few bulbs to ensure you have enough to pick. You need to ensure you have big fat bulbs; smaller bulbs may not bloom the first year. For roses, I’d suggest you raid a friend’s or family member’s well established rose bush. You could plant a few rose bushes yourself, but it’s unlikely you’ll get enough blooms to pick for a full bouquet. Also, depending on how hot it gets in your area, the peak for roses in the home garden is usually spring, tapering off in summer when it’s hot, with possibly another flush in autumn. That all depends on what rose it is, too. You could plant Oriental lily bulbs now. See this article here. If you’d like gerberas to flower on time you’d need to get the plants themselves, but you’d need several and that can be quite pricy. You could plant a few lamb’s ears for a filler foliage plant (stachys byzantina) or fail-proof succulents. Any leafy foliage plant could be good as a filler. I like bergenia, Magnolia grandifolia and eucaplytus. Perhaps you could source some of these in a neighbour’s garden. These are really very nice ideas you shared regarding the wedding flowers. I was looking for the different variety of it when reached here. I appreciate your post. My sister in law is a florist, and I was sure she would not grow her own until I red your article. Here in the Bay of Plenty things grow really easily – and your idea of or bulbs is great. I will pass that on to her. You have given good gardening advice. Thanks. Hi, what a great idea, though i never thought about it serisouly until I read your article, but now I really am considering doing this! I was wondering if you could help me though, on which plants could be ready around our wedding day? We are getting married next year, 12 April 2014. I love the look of dahlias, anemones, ranunculus, poppies, double tulips, lillies, alstroemerias and some roses, but I know some of these it will be the wrong season for! What will be feasible for us for that time of year and when should we start planting? Also, we are flatting at the moment, with not too much actual garden space, would this be doable with just lots and lots of pots? First of all, could you let me know where you live? Hi Courtney. Around that time the only flowers on your list that will be still in bloom are dahlias, so long as they are grown in a nice warm, sheltered spot. Dahlias grow well in pots but you want to make sure they are well watered and fed with a liquid fertiliser once a month. You could try roses and alstroermerias, but I wouldn’t bet on having too many flowers at that time of year. I would be more inclined to bank on just one or two roses to add to your bouquet, which would be made up of mostly other flowers. Some really good autumn flowers are zinnias, rudbeckias, sunflowers, dahlias and starball scabiosas (here and here). The latter are best used as dried seed heads and you can pick those in advance when they turn into seed heads and keep them until you need them. Sow these in containers late winter/early spring. Dahlia tubers can be planted in later winter/early spring too. Same for sunflower, zinnia and rudbeckia seed, though if you’re sowing rudbeckia, you want to make sure they are annual not perennial ones to make sure they will flower within the year. And don’t forget succulents. They’re easy peasy to grow and the rosette types look gorgeous in a bouquet. You can buy them now, as plants, and they’ll still be nice looking come April. They are not particularly fast growers so buy reasonably large plants if you want to use these. Don’t forget foliage too – maybe a neighbour, friend or family member has a tree you can raid (same idea for flowers too – ask them what they might have blooming in autumn), such as eucalyptus, evergreen maganolia, or other leaves. Test the leaves out in a vase first to see how long they last. Eucalyptus and evergreen magnolia are super long-lasting but not all foliage is. When sowing your seeds, make sure you sow quite a few, and sow some successively. Thanks so much for all that info! Will definitely be coming back to this over the next few months! Will no doubt have another question or two later on as well ..! So a few months later and I’m slowly getting everything organised for doing this! I just had a couple more questions. I’ve been looking up info on seeds, like the time from planting the seeds till flowering. If one says for example 100 days till flowering … that would probably mean the first flower or two? So (even though I will so successively) can I assume that I would be good to count back a couple of weeks further and plant say 114 days before to get more flowers on the plant? – if that makes sense! Also what would you say is the best thing to start the seeds in? A friend of mine says he is going to try those large egg trays for seedlings in his garden, would that work? My mum was thinking either these http://www.egmontseeds.co.nz/-c-1/petepot-18-cell-petepot or these http://www.egmontseeds.co.nz/-c-0/jiffy-7-pellets , or would you go with some of those pvc propogation trays? Last question! I’ve decided on dahlias, cosmos, zinnia and rudbeckia. (With a few roses and scabiosa) I’m doing most of the planting at my parents house, my family has cleared a few good spots on the back lawn for me to takeover. However I want to plant as much as possible to get as many flowers as possible just in case of whatever! So if any of these are well suited to pots I might as do that as well – which do you think would work best? Sorry for all the questions! I just want to get as good a start on this as possible! I would personally use the black plastic trays to sow my seeds. They are much cheaper and they can be reused later on. I do use the peat pots but only when I need a biodegradable pot (where you need to plant the pot and all in the ground where it will eventually rot, so as not to disturb plants that don’t like transplanting), but you don’t need them in this case. However the egg trays will be fine to use too. Where it says 100 days until flowering, that’s usually after it has been transplanted in the ground (unless it specifically says from sowing). So once you’ve sown your seeds and it starts growing and you transplant it in the ground, that’s when you count the 100 days. I’d allow for more than 100 days to be on the safe side. In fact, I’d start now – or soon. If you plant them out when it’s really hot they might get a little stressed. But if you start them off now, they will become established in the ground before the summer heat comes. The plants you have chosen will continue to flower over a long period so they will keep flowering until you need them. Remember to deadhead to keep the flowers coming, and fertilise once a month, perhaps every two weeks closer to the time if flowers are looking sparse. It’s definitely a good idea to plant as many as you can. And yes, these will all grow in pots too. If you are planting dahlia tubers (not seeds), plant the tubers directly in the ground – not in the trays. They should be planted now. If you’re planting seeds, make sure you don’t choose a bedding type. They have short stems which are not so suitable for bouquets. I think that’s it. Give me a shout if you have any more questions. And I hope you take photos! I’d love to see your project unfold. Wow thanks again for some great advice, I really really appreciate it! Will definitely take photo’s! One last question for now (I hope!) I have a few roses in pots, how often would you feed them? I looked in the Yates garden guide but it doesn’t say too much about this. No problem. A slow-release fertiliser is good for Roses in containers with the occasional liquid feed as well. You don’t want to overfeed or you will ‘burn’ the plants. Though if you don’t feed them they will starve and won’t produce flowers. If you have slow-release fertiliser in your soil then perhaps 2-3 liquid feeds would be good. So … I have a whole bunch of dahlias on the go, as well as zinnias, cosmos and chrystanthemums (mums idea), and they’re all flowering well, especially the dahlias which are going off! My question is, is there much else I can do other than dead heading to keep them flowering till early April? I spoke to a florist a couple of weeks ago and she was unsure if the commercial growers she bought from had dahlias that late? I know I’ll probably have to supplement my lot with stuff from a florist because I’d like HEAPS of flowers, but I still want lots of my own. You’ll need to consistently feed your dahlias to make sure they bloom that late, though in Auckland they should do. From mid February I’d start feeding your dahlias fortnightly if they look like they are starting to slow down. Keep deadheading, as you are already doing. Your zinnias, chrysanthemums and cosmos should all be blooming then too, though you might want to feed them fortnightly too. As for your roses, if there are quite a few aphids I would give them a spray. The ladybugs are a great idea but if you’re infested with aphids, it might be worth spraying to get on top of them. The ‘every 10 days’ spraying is recommended because the spray won’t get to the eggs that have already been laid, so you need to spray again to get the subsequent hatchings. After the first couple of sprays you may only need to spray once a fortnight or less. Aphids are often attracted to plants that are stressed. If your roses are in containers they might be water stressed. In containers they need lots of water over summer. You can blast aphids off with the hose, though it might not be good for the flower. When I get aphids on my vegetables, I blast them, and it’s very effective, though on roses you are likely to lose the flowers. I live in Hastings, Hawkes Bay and planning to get married at the very start of November. Any suggestions on what I could grow for my wedding bouquets? I think peonies will be out, but not sure I could grow my own in time unless I buy an established plant? I love bright colours and wild flowers, but also different shades of green foliage too. I’d love to hear your suggestions on plants that will bear lots of flowers given some TLC. Hi Alana. You’re right, peonies should be out at that time but you would need a well established plant (planted in the ground for three or so years) for you to get enough blooms. Roses would be ideal, and new bushes can be planted in winter, but again, you would probably not have enough blooms for a full bouquet. You could scout around friends and neighbours to see if they have roses that would fill out your bouquet. If you like the look of honeywort (Cerinthe major) you could sow seeds now directly in the ground. They are cold hardy and flower from the end of winter through spring. You could also sow cornflowers but sow these in trays then pot them up in larger pots when they’re big enough. Keep them protected over winter. You can either keep them in pots or plant them in the garden late winter or early spring. The timing is right to sow sweet peas now too (sow them directly in the ground or in large pots) and they should flower for you at the right time. Sweet peas come in all colours, including bright hues. You could try planting freesias though if it’s a warm season there is no guarantee they’ll still be in bloom. It’s worth trying though. Plant them in pots and keep them in a smaller spot. You can still plant daffodils too, but get the bulbs in the ground, or in pots, quickly. It’s worth staggering the bulbs (plant a few once a week for a month) to give you a better chance of having some in bloom at the right time. As for foliage, your best bet is to head outside and see what’s growing in the garden or in your neighbour’s garden. The good thing about foliage is you can test its vase life well before your wedding. Once you’ve choosen your flowers decided whether you want dark green, light green, glossy or mat or grey foliage. I live in Auckland and am planning on growing my own flowers for my coromandel wedding in early February. I already have a bunch of dahlias in storage that I am hoping to plant late late September (hopefully once there is no frost risk!) – is it right that if I plant them then they should have a good number of flowers by Feb? I was a bit worried that waiting until late Sept would be too late as because of the warm winter some have already started sprouting? Mostly I am planning on using the flowers for the table settings loosely arranged in small vases and am going for a rustic/wildflower look in a mixed pastel colour palette (my dahlias are lavender, pale pink, white and apricot). What other flowers do you think would be good to grow to fit in with this theme and timeframe? I can either have someone cut the flowers from my garden on the friday (its a saturday wedding and we will be out of auckland from weds) or grow some in pots to take with us. Being in Auckland you could actually plant them sooner than late September. In fact, if you live in an area that doesn’t really get any frosts you could plant them now. But you could plant them now anyway if you planted them in containers. They will definitely be flowering in time. How about cosmos, which come in white or pink. They are very easy to grow and quite prolific.You could also look at dusty miller, which is a grey-leafed foliage plant. It’s really pretty and goes well with many flowers, particular white and pink ones. Hi sorry I have one other question. I was also hoping to have a number of small plants dotted around either on tables or where the outdoor ceremony will be and am looking for a white flower that would be suitable for growing in a small pot. I know that it can be hot at this time of year and many annuals dont survive in small pots. One suggestion was pansies and another allysium – would these be suitable and do you have any other ideas? Also when would be the best time to plant them out? (you csn often get cheap multipacks of 6/12 seedlings). Ideally something that continuously flowers as I know some annuals have flushes. Yes, both pansies and alyssum would be suitable for small pots. Also impatiens – you can get these in seedlings too. Pansies, however, don’t like the summer heat so much, so if you go down that route, I’d buy the seedlings about 1 or 1.5 months beforehand (same for others), plant them all in a big container and keep the container well watered and in part shade (also impatiens; alyssum can go in full sun). Closer to your wedding you can pot them up in their smaller pots. Keep them feed to produce more blooms, and pinch of any dead blooms to encourage more. Thanks so much Jane, your advice is really useful!! You are welcome. I would love to hear how it goes! I’ve just found this site and it looks like the one I need. One of my daughters is getting married in March. She wants simple flowers, hand-tied for her and her two sisters, small buttonholes and corsages for other members of the wedding party, jam-jars on the tables, in sweet-pea colours with lots of green. I’m beginning to think I’ll be dashing round the supermarkets on the morning of the wedding snatching up anything daisy-ish. Please, do you have any suggestions? come in a range of colours. What do you mean by sweet pea colours? don’t dismiss them if they last only a couple of days. Im getting married in August and I live in Alaska. I bought some ranunculus bulbs and am planning on starting them in side. I know I need to start them in the spring. What month should I start growing them inside if I want them to be blooming in late August? Unfortunately I’m unfamiliar with Alaskan weather conditions but in New Zealand we plant our ranunculus bulbs in autumn. It would be too warm for the bulbs if we planted them in spring. Your seasons are also opposite to us so I’m not sure what season your late August is. It might be best to find an article that has been written in Alaska, or a place of similar conditions to be certain you’ll get blooms on time. In any case, I would plant the bulbs successively (every two weeks) to ensure a long flowering period that coincides with your weather. Sorry I couldn’t help further. I got quite interested with trying to plant flowers for my feb 2015 wedding. But I haven’t planted flowers before. Can you help me? The easiest to grow. I live in auckland and I wanted a pink bouquet and vintage designed flowers for the tables. I’d probably try planting 3 flowers and 2 plant fillers. Could you help me on when to start growing them? I might be trying dahlias pompom, cosmos, and gerbera. will that work? and can i just put them in a pot? I only live in an apartment without my own garden really. Yes, dahlias, cosmos and gerberas all flower at that time of the year, though gerberas are not as easy to grow as the other two. Dahlias and cosmos are a cinch – you can grow them in containers, so long as you keep them well watered. Dahlia tubers can be planted in spring and cosmos seeds sown in spring too. Keep them deadheaded (or pick the flowers) once they start flowering to keep them in continuous bloom. Gerberas are sown in spring too, but they sometimes don’t flower until the following spring. It’s worth a try though, but I would have a back-up flower just in case. If you like hydrangeas these would be a perfect choice for that time of year. Callas are lovely too. Or you could plant sunflowers, sweet peas, dahlias, Queen Anne’s lace, Asiatic or Oriental lilies. I really love the grey-leafed dusty miller as a filler foliage. It’s very soft and elegant. I am having my wedding in late January next year. Love your post! I will be planting in Hahei in the Coromandel and I am seeking your opinion about flowers to grow that will be ready in time. I love the look of dahiahs, poppies, anemone and snap dragons etc. I am mainly wanting a selection of beautiful bright blooms to pick for my table settings, what do you suggest? I also have a selection of succulents already established. Many thanks! Of the flowers you suggest the only one that won’t work are anemones. These are cool season plants, flowering from winter to late spring, or early summer in cooler areas. The rest are perfect, especially succulents which are no-fail plants. You can also try cosmos, sunflowers, zinnias and angelonia (similar to snapdragons). We would love to Eco source for our wedding in November but would also like to plant in our gardens our own flowers . What would you recommend that would flower in time for late November ? That might depend on where you live, if you could let me know. You could try cosmos, but make sure you sow them in trays in early August, the sooner the better, and keep them in a sheltered spot. Cornflowers are another wildflower type flower that will be in flower then, if sown early. Another one to try are sweet peas. Not so much wildflower like, but beautiful smelling. You can plant those anytime from now. Sweet peas don’t need mollycoddling. Just sow them in the ground outdoors – they are hardy over winter. Snapdragons are another to try. Sow them in trays early August. Hi there! You have some great tips here. We are looking at a wedding in February 2015 in West Auckland. The theme is tending towards wildflower, soft, romantic. Would it be safe to consider gypsophila, snapdragons, sweet peas and scabiosa for vases and to supplement bouquets etc? My main concern, of course, is the timing of everything from seed or seedling to flowering on cue. What advice could you give in terms of when to sow or to plant out seedlings for these flowers? Do you have any suggestions for other flowers/foliage that could fit into that look we’re going for? The one I wouldn’t bet on in your list is sweet peas. By that time they will be looking scraggly, especially since they are prone to mildew from Auckland’s high humidity. They others should all be fine. Sow them all at the end of this month in pots or trays and keep them moist (not wet) and in a warm, sheltered spot. Once they’re big enough, pot them into larger pots, or if you have a place in the garden, plant them there to grow on. Other flowers to consider are cosmos, dahlias, rudbeckias and zinnias. You could also look at using herbs in your bouquet – even just the foliage, like rosemary and sage leaves, which will smell lovely. Eucalyptus leaves are lovely for foliage as well. And feverfew flowers are gorgeous too – they are small white daisy-like flowers with yellow centres. There’s a white chrysanthemum (small flower about 2cm wide) with a yellow centre that you can buy in the potted colour section of garden centres (they are there now). They are very cheap and they are very long lasting too. These would be fabulous in a wild flower bouquet. You can buy them now (or when you’re ready) and plant them in your garden. They flower continuously. Just deadhead them to keep the flowers coming. Thank you so much for your considered reply – greatly appreciated – I will give this careful thought and proceed forward from here! My daughter is getting married November 14th 2015 at home here in the Waikato. Was wondering what plants would be nice in the garden at that time of year that would make a nice show. You could try sweet peas. Plant a succession of them from autumn to get a good crop. Roses will be out in the garden at that time. If you have existing roses – great. Otherwise you could get a few bushes in now. Or you could buy a couple of really nice standard roses in pots a week or two before the wedding. You could also look at annuals such as pansies, cornflowers and snapdragons for your flower beds, or perennials like alstroemerias. thank you for that info. will give it a try. I have a daughter’s wedding mid February and will have some functions in our garden before and after the wedding as many guests are from overseas. I want my roses to be as full of blooms as possible during that time. I know it won’t be as good as the first mass blooming in a week or two, but can you advise on how long it takes from dead heading to good numbers of blooms. In past summers I feel I can go for a week or so without any blooms at all. I regularly deadhead 2 or 3 times a week and cut down to first bunch of 5 leaves. So I want to do what I can to have my roses flowering well. I live in south Taranaki, roses are scentasia, best friend, aotearoa, iceberg, a few climbers, some carpet roses and some old ones from grandmother’s garden. Yes, it probably would be a bit late to plant now for March, though you could possibly get seedlings from your local garden centre which might flower in time. You could look at salvias (you can pick up potted colour in garden centres closer to the time), angelonias (you may find seedlings now), heliotrope (not terribly long-lasting though), lavender, dahlias (too late to plant to get flowers for March though) and even hydrangeas, which should still be flowering at that time. You can pick hydrangeas up from garden centres now. Hi Jane, what a wonderful find this page is!We have a daughter getting married mid March-here in mT Albert, Auckland. While we aren’t having the wedding here we will be having the”day-after”. Just wondering if the advice for deadheading roses 6-8 weeks before-Bob Matthews-is also true for Auckland?Our roses are looking gorgeous at the moment, and we would love the same look for her day.Thanks so much. Hi Rosemary. Yes, it would be pretty much the same. It is always dependent on the weather though. If we suddenly have a cool spell, for example, growth might slow a little. But generally speaking, it should work in Auckland too. Good luck! Thanks so much- I will let you know! Hi I love this article I’m getting married in March 2016 and wondering what the perfect flowers to grow would be that can be cut. I’m having glass mason jars on the table and wanting some beautiful flowers in blush white and pink tones I also have rustic jars with lace and burlap and will be having hundreds of candles. what would be the best to grow? I also want to do flowers for my boutiques anything you could suggest I’m in Tauranga. You could look at dahlias. These are easy to grow and prolific and come in many, many colours, including what you are after. You would plant the dahlia tubers in August or September, when they are available at garden centres. You could also look at zinnias, and even cosmos. Just needing some advise. My daughter is getting married at the end of October in Southland and we are wanting to grow our own flowers for the tables. Can you give us some ideas on what we could have ready then. Kind of what and when to plant. Pink and white spring theme is the plan but any flower suggestions would be great. You could look at planting freesias. Plant them as soon as the bulbs become available in shops, and stagger the planting every two weeks for the next couple of months. I would plant some in the ground and some in containers in case one works better than the other. Use a specialised bulb food as well. Feed them when planting and again when the stems appear. Tulips may also flower at this time too. You could try gypsophila. I would sow seeds in autumn and keep the pots sheltered over winter. Hopefully they will flower in time. They like a bit of warmth and longer days to bloom. Don’t forget, foliage is a great filler, so take a look around your garden now and think what foliage can be used. Rose-shaped succulents, in my books, are a winner too. Hi Jane, firstly what a fabulous post with such detailed responses! I am getting married mid february next year and am looking at planting my own flowers to use for table setting and other decorations. The look I am tying to create is several old vintage bottles on tables with single stemed white flowers…. any type as long as they are white. My question is what do you suggest I plant and when? Our location is Canterbury. You could go for plants like white cosmos (here, and here), feverfew, annual chrysanthemums and dahlias. Cosmos can be sown in spring sometime. I would get them started early and keep them going. Just deadhead them to keep the flowers coming. Same with dahlias. The tubers can go in the ground in spring. Keep deadheading the dahlia flowers too to keep more flowers coming. Growing conditions for dahlias are here. Feverfew plants can be found in the herb section at garden centres. If you like these, plant several in spring/summer and, again, keep deadheading them. The small-headed annual chrysanthemums, which look very similar to feverfew flowers, can be found in the potted colour section. They are very cheap to buy, so you could buy several of these. You might also like to check if any of your friends, family members or neighbours have white roses in their garden that could act as a standby. And you could also plant shasta daisies, but you would normally buy these as fully grown plants. They are typically in garden centres from summer onwards. Hello! I have just found your website and what a find!! I love it!! I know you get asked about best planting times for weddings but looking up there doesn’t seem to have been anyone having an autumn wedding so I am going to ask ? We are getting married 7th May 2016 and I was thinking of having a go at growing some flowers. Is there anything you could suggest and when would be the best time to plant? Thanks and I look forward to getting your emails as I have subscribed!! Can you let me know where you are based? Ooo sorry only just saw this. Based in Auckland ? Is it this coming May (2016)? If so, unfortunately, it may be a little late to start planting now. Sowing is best done spring to early summer and then again from late summer (for spring flowering). However, that’s not to say you can’t sow now (midsummer), though I find it is typically an in-between time. I would try cosmos and annual gypsophila though. I might also be inclined to go the garden centre and look at the seedlings available too. However, again, seedlings that might flower in February, March, April may not continue into May. Look for some snapdragons (antirrhinums). Late summer/autumn flowering plants like rudbeckias and asters may still be in flower then, but I would look for fully grown plants at garden centres. Feverfew is very prolific. This will still be in flower in May. You can get these plants in the herb section at the garden centre. Plant these now and they will definitely be flowering in May (well, I guess I can’t say definitely, but it’s highly likely). They grow quite quickly so they will be quite big my May. Deadhead the flowers as they fade. What a great site!! Helping a young lady with a low budget wedding. The wedding is July 16 in the southeastern area of the state of Virginia. Wedding will be on the beach (weather permitting. Reception will be in an outdoor pavilion. The color palate is blues, peaches, white. 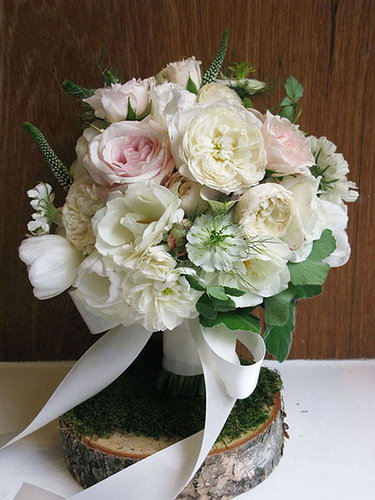 The bride prefers rustic – natural – garden arrangements. I would like to start planting some flowers now for the wedding. I live on a lot of land. The flowers can also be container grown as she bride can use them in rustic pots for decoration as well. Would also like to make some floral garland or swag if possible.. Realize this is quite a project and accept the fact that some flowers may need to be store bought but I’d love to be able to contribute some by growing them to cut on cost. The bride is open to other colors but really wants to include blue. It is for where bride and groom take vows. A wide half circle of planted flowers and grasses. surrounded the officiant. The couple standing at open side of half circle.. The width of half circle is about 10 feet. The foliage starts shorter at ends of half circle on the sides of couple then gradually increases in height to the back. The very back/top/apex of half circle, behind officiant is lovely, tall white grasses. Again, not expecting to duplicate exactly by any means and foliage/flowers will have to be in pots – but any chance of replicating this image?? First, I need to say that because I live in New Zealand I cannot really comment on the flowers and foliage that you can grow in your area as I’m unfamiliar with your climate/growing conditions. But in general terms, I don’t see why you cannot replicate the design you describe. It’s really a matter of going to your local garden centre and seeing what type of foliage plants they have there, and then planting them up. I would plant them fairly closely in this instance, since the plants won’t have a great deal of time to grow from now until the wedding. After the wedding you can thin them out if necessary or plant them in other parts of your garden. You could look at heuchera for a peach coloured foliage plant, and possibly dahlias and zinnias for peach flowers. A summer flowering (I presume July is summer?) blue flower could be hydrangea. Cosmos is a lovely white plant that could be planted both in the ground and in pots. You could also plant it amongst the grasses in the semi circle you described. I am getting married in akaroa next November and would love to try and grow some flowers to put into our bouquets. Quite like the look of succulents and like a rustic look. Any suggestions would be great thankyou!! I love succulents myself, and these would be a great choice for a rustic bouquet. Daisy-like flowers are great for rustic bouquets too. Chamomile has really pretty, small, daisy flowers, as does feverfew. Feverfew is a perennial and is easier to grow; chamomile is an annual and not as prolific, but very pretty. Both will flower at this time and have very similar flowers. You can get these plants in the herb section at garden centres. You could get your feverfew in summer and plant it (keep it sheltered over winter) so that it gets a good growth spurt on. Get a chamomile plant in spring when they come into the shops. You could also sow chamomile seeds in autumn (under cover) and plant them out in spring. You could try growing sweet peas (sow seeds directly in the ground in autumn to winter, successively), for their delicious scent, and many of the euphorbias, such as Euphorbia polychroma, flower at this time too. Best to get a plant of this. Another one to try is love-in-a-mist (Nigella damascena). Sow these seeds in August under cover. Sow them successively (every two weeks) to ensure you’ll get blooms at the right time. (Hopefully, depending on when your wedding is in November.) Best of luck! Planning for a late May wedding next year. What easy to grow plants flower reliably then that are suitable for bouquets? We are Waikato based, so will probably have had the first frosts of the year. Late May can be an awkward time if you have frosts but there are some plants you can try. For foliage, there’s Nandina domestica, whose leaves will be, or will nearly be, red or orange. Another foliage plant is Loropetalum ‘China Pink’ which has deep green-burgundy leaves. Some of the winter heaths will flower at this time, like Erica carnea ‘Springwood White’, or other colours, as will some of the Erica melanthera varieties. The flowers are very long lasting and plants are frost hardy. I would look for these plants in shops now so you can be sure of the flower colours you are getting and to get them growing well. You could also look at some of the leucadendrons – again, take a look at garden centres now to see what is around. And don’t forget succulents, if you like those. Calendulas can be grown for bright colour, if given some shelter. You could also plant anemones in late January/early February and they should flower for you in May. Likewise for iceland poppies if you sow them early enough – say late January or early February. I would have some backup plan, though (in other words, don’t just rely on anemones, for example), in case they don’t flower for you on time. As home gardeners, we’re often reliant on the weather as to whether our flowers perform or not. Good luck! I already have succulents growing and more being propogated for table decorations. Leucadendrons are a good idea, and I shall also try anemones. Hi Alice. It sounds like you have pretty much got it sorted! It sounds like your place will be beautiful. 🙂 I did look on your Pinterest site but couldn’t find a board called Cutting Garden though you did have some others there which I looked at. Some suggestions, if you haven’t thought of them already, are cosmos (prolific and constant), sweet peas (for a tepee or trellis), Asiatic and Oriental lilies, cornflower, larkspur, ageratum, alstroemeria, snapdragons, dahlias, foxgloves, linaria, penstemon, poppies and feverfew. Thank you for your reply and suggestions! Sorry I realised its named Orchard Garden (oops). I failed at having weed free wildflower garden last year, lots of flowers but so many weeds. Now Sweet peas… Can they handle full sun? I read some prefer partial shade? And some of the biennials I wasn’t sure about whether they would flower or not. Yes, with wildflower gardens you have to make sure you kill all the weeds before you start planting. This might actually take a couple of seasons (since when you spray you don’t get all the weed seeds in the soil initially so they pop up again in a few weeks’ time) to get them, and even then you’ll have some seeds blow in on the wind. Yes, sweet peas are fine with a little bit of shade because they actually have low light requirements. Though they will grow in full sun too. I prefer growing mine in full sun. In very hot areas, a little shade is probably best. They need plenty of water when flowering, and they like lots of food too. You will need to keep deadheading to ensure you get lots of flowers for the wedding. With biennials, typically you would plant them the year before in spring and they will flower the following year. Wonderful ideas! What are possibilities to plant now for pretty flowers for mid December? It will have to be bedding plants not seeds I realise. My parents will be having their emerald annivery (55th). I would actually head to your local garden centre and see what they have in stock. Basically, whatever you fancy, plant it! Though, I am assuming here that you are talking about garden plants as oppose to cut flowers? I was hoping to get your guidance for Merlot, Red, light pink colored flowers for a wedding in early January, preferably a rustic looking bouquet. I love peonies but realise they are out of season. A friend has also suggested planting my own. I live in Wanaka so any help would be much appreciated! thanks so much. You could look at dahlias – these come in many colours, including the colours you desire, and are easy to grow. There are a couple of gorgeous merlot/burgundy coloured geraniums too, which make great cut flowers. You could look at roses. Burgundy Iceberg rose flowers continuously over the summer period. You could plant 2-3 bushes and you should have some in bloom for early January. Other ideas are zinnias (easy to grow), red cosmos (also easy to grow), clematis, red scabiosa (a beautiful deep burgundy), snapdragons (easy) and celosia. I wasn’t sure if you meant the wedding was for 2017. If so, it’s too late to sow seeds now. You would need to plant seedlings, and bigger plants (in the case of roses and clematis). We have our daughter’s wedding early Oct 2018. We are in Mid Cannterbury what flowers /plants can I look at planting this season to be established by then, the flowers would be for decoration on tables etc. Thanks for any advice. If you’re planting now, I guess you are looking at perennials. In that case, you could look at roses (you will be a better judge as to when these begin to flower in your area), viburnum, lady’s mantle, aquilegia, candytuft (iberis), clematis, leucanthemum daisy and primrose. I must say I am a big fan of this page. You have offered me some refreshing advice and some hope I can reduce my ever increasing flower bill for our wedding. We are getting married January 20th 2018 and between my family and my fiancé we have some very green fingered relatives. I will get my bouquets done at the florist but I was wondering what would be good to plant for a rustic themed wedding table decorations with pinks, whites and hints of deep red/burgundy. Any advice you could offer on what to plant, when to plant it and tips for them to thrive would be fantastic. Thank you so much, Caitlyn. Sorry I forgot the location. My family live in Oamaru, Geraldine and Timaru in the South Island. Hi Catilyn. With rustic style weddings, you can get away with most flowers if your vase/containers are rustic themselves (like jars, recycled tin cans, jugs, etc). So you could virtually have anything. Dahlias, cosmos, strawflowers, feverfew, pelargonium, zinnias, Dusty Miller senecio foliage (grey), rosemary foliage, even blackberry and raspberry branches with unripe berries look fantastic in the vase. Everything to sow from seed should be started in September. Sow successively (a few seeds every couple of weeks) so that you are certain to get flowers at the time you want. Really, all you have to do is make sure you keep them well watered and fed, and pinch of the dead heads leading up to the wedding so that they produce more. I came across your website through a google search and am wondering if you could help. We are getting married in September next year and I’d like to do my own flowers. We live in Wellington and have a cat so can’t plant anything that would make him sick! I keep finding nice flowers but then they are poisonous 🙁 Any suggestions? Hi Lisa. September can be a difficult month for flowers as early spring weather is very interchangeable. It’s often a little too early for the annual flowers. Bulbs, however, are in bloom. Some flowering shrubs will be too. I would suggest you head along to your local garden centre now and see what is in flower and what you like the look of. What is flowering in your area will be different to what is flowering in my area right now. You may have some daffodils in flower. Ranunculus and anemones are some of my favourite bulbs. This could be something for you to consider. Sweet peas, if you plant them early enough (autumn) might be something for you too.